Language justice is defined as the right everyone has to communicate in the language in which they feel most comfortable, and involves creating space for a coexistence of languages. Jesus, a production worker at the Farm Hub, enjoys attending agriculture workshops and conferences to expand his knowledge, but for years he only understood pieces of the presentations. The majority of events were held in English and hard to track for the native Spanish speaker. “With events where there isn’t interpretation I often don’t understand 100 percent, but especially with the ones that aren’t directly related to what I do in agriculture, I understand even less, perhaps 60 percent,” he says. That changed in early February when he attended the High Tunnel Farmer to Farmer Meeting, an educational series, organized by Cornell Cooperative Extension at the Poughkeepsie Farm Project/Environmental Cooperative at the Vassar Barns. The day-long workshop involved presentations (including by Jeff Arnold, the Farm Hub’s vegetable production manager) and tours centered on strategies for building hoop houses for winter farming. This time, everything was fully interpreted into Spanish by a group of colleagues who attended on behalf of the Farm Hub’s Language Justice team. The event was attended by both Farm Hub staff who are non-English speakers as well as bilingual staff, who among their other job responsibilities, serve as interpreters as part of the Farm Hub’s six-person Language Justice team. The team provides regular translation and interpretation for meetings and events at the Farm Hub. The February high tunnel workshop marked the first time the Farm Hub offered interpretation for an external event. 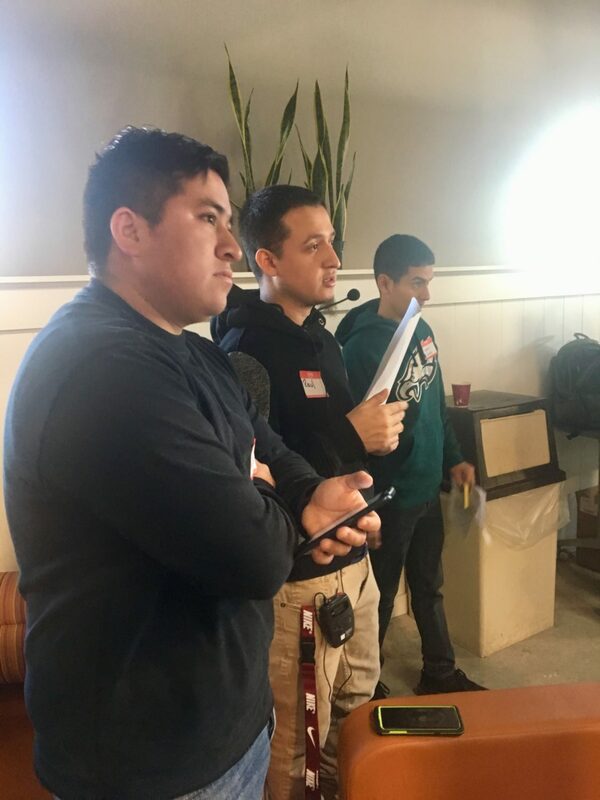 The Language Justice team provided simultaneous interpretation for Spanish speakers throughout the day; simultaneous interpretation is conducted in real-time while the speaker or signer continues to speak or sign. Members of the Language Justice team at the Farm Hub interpreting at the farmer-to-farmer meeting. Language justice, including its principles, is defined as the right everyone has to communicate in the language in which they feel most comfortable, and involves creating space for coexistence of languages. This is most often realized through offering interpretation in various languages, says Adriana Pericchi, the Language Justice Coordinator. The farmer-to-farmer event provided an opportunity to demonstrate this new approach, to the benefit of several Spanish speaking growers from the Farm Hub and other farms in the region. The result was that no matter what language a person spoke they were able to hear and understand the presentations in their own language. 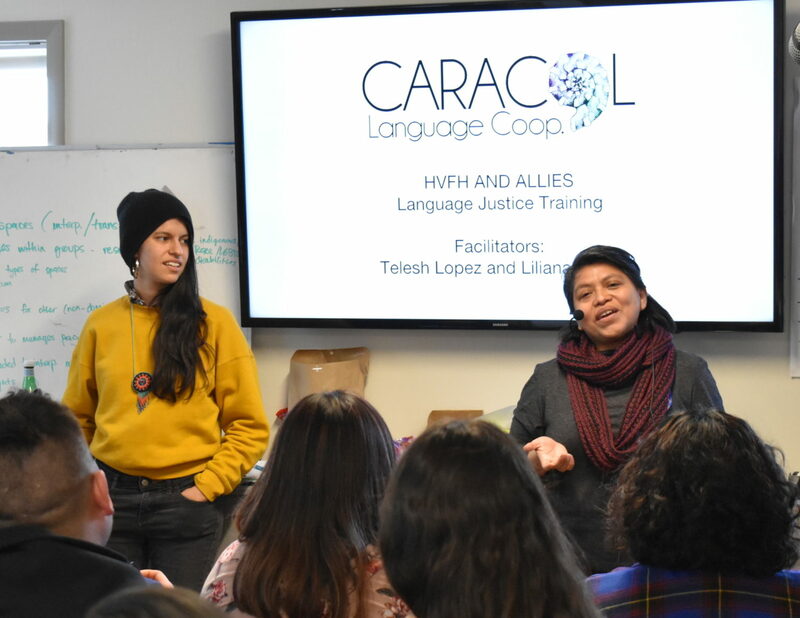 “The goal was to create a multilingual space so that both monolingual Spanish and English speakers could feel safe in sharing their expertise in the room,” says Raul Carreon, the Farm Hub’s post-harvest coordinator and a member of the Language Justice team. It was also an opportunity to consider extending the idea of language justice to community organizations in the region. To be sure, there exists a noticeable gap between the number of Spanish speakers in the agriculture sector and their attendance at industry events and conferences, with a lacking of interpretation as these events. The paradox can be seen by numbers; according to the latest data from the Bureau of Labor Statistics, persons of Hispanic or Latino ethnicity make up 23.1 percent of the agriculture, forestry, fishing, and hunting industries. In 2015, 83 percent of farmworkers were identified as Hispanic, a majority of them having been born in Mexico and speaking Spanish as their primary language, according to a report commissioned for the U.S. Department of Labor, Employment and Training Administration’s Office of Policy Development and Research. Acknowledging this disparity, the Farm Hub has stepped up its efforts to offer interpretation and translation to its own staff and, along with that, is training staff in interpreting and translating. The Language Justice team will soon be completing a 40-hour online training certificate with the University of Arizona. The idea for a fully interpreted training workshop sparked when Cornell’s Ethan Grundberg, a vegetable specialist and one of the event’s organizers, reached out to Gabriela Pereyra, the Beginner Farmer Program Manager at GrowNYC, a non-profit that fosters farming and healthy eating in the urban environment. Pereyra, who works closely with growers, many of whom are immigrants in the New York tri-state area, asked if the presentations could be made available in Spanish. Pereya notes most agriculture meetings and workshops do not provide interpretation. Grundberg was familiar with the Farm Hub’s language justice work and asked if the Farm Hub would be willing to provide interpretation. Interpretation success came down to teamwork and careful planning. Given the amount of specific terminology involved, the Language Justice team created a list of agriculture centric words focused on high tunnel building and fashioned a bilingual glossary. The effort also involved working in pairs with one person checking the other in the case they came across an unknown word. Team members would then find the word through apps such as Linguee and WordReference on the phone. They also practiced tag-team interpreting in shifts. On the day of, the team arrived early to set up and test the interpretation headsets, but soon discovered there were many more attendees – over 90 – and there wouldn’t be enough to go around. A solution was quickly found – rather than hand out 60 headsets and come up short, the interpretation team only gave the machines to Spanish speakers. For the English speakers, the team interpreted consecutively, which involved standing next to the speaker and interpreting out-loud during the presentation. The feedback from Spanish growers who attended the Cornell event has also been overwhelmingly favorable. Jesus calls providing interpretation at industry events “a great change for the good,” and would encourage Spanish speakers to contribute their knowledge and expertise to English speakers too. Simultaneous interpretation = (spoken in real-time) The rendering of a speaker’s or signer’s message into another language in real-time, while the speaker or signer continues to speak or sign. Consecutive interpretation = (spoken with pauses) The rendering of a speaker’s or signer’s message into another language when the speaker or signer pauses to allow interpreting. Translation = (written) The written communication of meaning from one language (the source language) to another language (the target language).